Methylthiolation of tRNALys(UUU) by Cdkal1 controls the decoding accuracy of the lysine codon. (A) The molecular structure of tRNALys(UUU) and ms2t6A. (B) Results of a mass spectrometric analysis of the ms2t6A modification of tRNA in MIN6 and HeLa cells. The upper panels show the UV trace, and the middle and lower panels show the mass chromatograms for detecting t6A (m/z 413, arrow) and ms2t6A (m/z 459, arrow), respectively. (C) Results of a mass spectrometric analysis of the ms2t6A modification of tRNA isolated from the pancreas of Cdkal1–/– and WT mice. The arrow indicates ms2t6A (m/z 459). (D) Modification of tRNALys(UUU) isolated from the liver of Cdkal1–/– and WT mice. The upper panels show mass chromatograms of GGDp fragments in tRNALys(UUU). The middle and lower panels show mass chromatograms of ms2t6AAΨp fragments and t6AAΨp fragments, respectively. 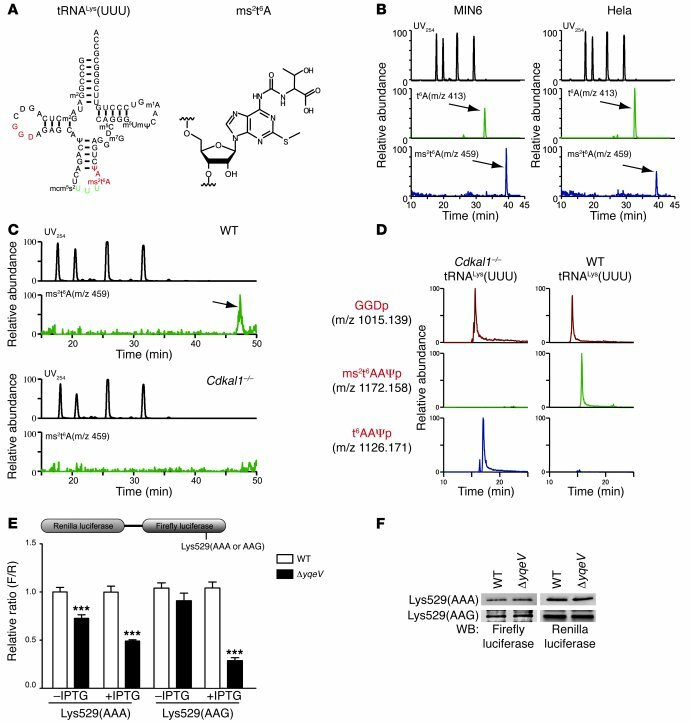 (E) WT and ΔyqeV cells were transformed with a reporter plasmid in which both Renilla renilla and firefly luciferases are cloned with the lac promoter (upper panel). Relative activity was determined by normalizing firefly luciferase intensity to renilla luciferase intensity (F/R, lower panel). Data are presented as the mean ± SEM, and asterisks indicate statistical significance determined by Student’s t test. ***P < 0.001; n = 4. (F) The expression level of the fusion protein of firefly and renilla luciferase after IPTG treatment induction was determined in WT and ΔyqeV cells (E) by Western blot.